Ever since Peugeot unveiled the multi-award winning 308, a GTi version has been keenly awaited. Rising to the challenge, Peugeot says the 308 GTi offers drivers the ultimate ride. Featuring a 1.6 litre THP Stop Start engine, it will be available in a choice of 250bhp or 270bhp, with Torsen limited slip differential, chassis tuning and Peugeot iCockpit. And Peugeot claims this Peugeot 308 GTi is a new class-leader, offering balanced power and performance. It also says the 1.6 litre engine is the most efficient in its category, capping CO2 at 139km and returning 6.0 litres/100km consumption. 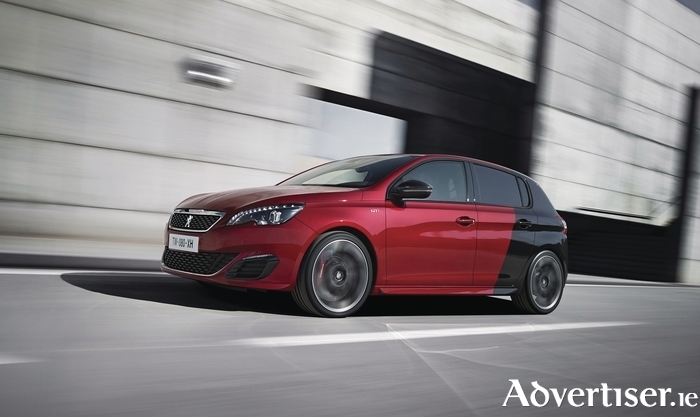 The new Peugeot 308 GTi, unveiled at the Goodwood Festival of Speed recently, will be launched in Ireland this autumn. Drawing on its unparalleled competition experience, Peugeot Sport is a division devoted exclusively to developing the brand’s most high-performance models. Clear specifications were given to Peugeot Sport during the 308 GTi brief, to develop a compact, safe, incisive car with athletic allure for the ultimate driving pleasure. Sitting 11mm lower to the ground on wider tracks, with a new front and rear design, driver-adjusted chassis, power-packed engines, sporty interior and noise from the tailpipe, the new Peugeot 308 GTi is described as a triumphant turnout. We are told the 308 GTi 270bhp sets a new record for power-to-weight ratio in its segment, at just 4.46kg per unit of horsepower, and does 0-100kph in a mere six seconds, covering 1,000 metres from a standard start in 25.3 seconds. It is equipped with Torsen limited-slip differential technology to improve cornering and 19” alloys shod with Michelin Super Sport tyres. Peugeot says a sportier ESP design allows more latitude, with more drift on bends. It is ready to perform at the drop of a hat, offering a nearly constant power ramp-up until the needle reaches the rev limiter at 6,500rpm, at which point it reaches thrilling speeds. Maximum torque ranges from 1,900 to 5,000rpm. Power and torque are perfectly regulated thanks to the special wastegate valve design. The entry level model 308 GTi 250bhp features the same engine as its more powerful sibling and goes from 0-100kph in 6.2 seconds and covers 1,000 metres from a standing start in 25.6 seconds, thanks to a power-to-weight ratio of just 4.82kg/bhp. To rein in all that power, the car has 380mm discs in the front with red Peugeot Sport calipers and 268mm counterparts in the rear. The Pseudo McPherson strut in the front operates with precision while the rear axle twist-beam system ensures seamless pairing. Rear wishbone stiffness has been increased, as have the rear beam, silent blocs, springs and cushioning. "The French carmaker says the interior styling is unabashedly sporty"
Full LED headlamps flank an exclusive black radiator grille with horizontal chequered pattern and gloss black finish. There are two front spoilers below the bumper, adding to aerodynamic performance, with an SCx of just 0.69. At the rear, Peugeot Sport says the car’s ground-hugging qualities are underscored by a gloss-black extractor incorporating two ample exhaust pipes. The body comes in six colourways, with the GTi 270bhp version featuring the exclusive Coupe Franche combination livery of Ultimate Red and Perla Nera Black. The GTi signature is clearly visible on the front wings and the tailgate. The French carmaker says the interior styling is unabashedly sporty, with red stitching features on the dash, upholstery, door panels, gear lever and floor mats. The compact steering wheel provides natural grip and flawless precision, while the user-friendly feel of the iCockpit promotes safe and instinctive driving. The Driver Sport Pack allows the driver to amp up the high-octane feel; by pressing the Sport button the centre console display colour changes from white to red, the engine growl is enhanced, accelerator pedal mapping changes and additional information is shown on the central read-out – power, torque, boost, lateral and longitudinal acceleration.